"I don't run against Pamela, I run against myself. We are like sisters in this game and I'm under no pressure to beat her." - Kenya's Janeth Jepkosgei, who - despite being surpassed by Pamela Jelimo in 2008 - is still revered in her hometown of Kapsumbeiywo, where she funds 3 of the local school's 9 teachers. 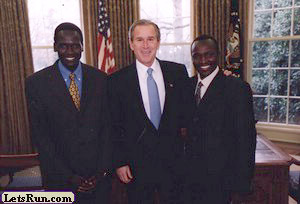 Jepkosgei will hopefully compete in the 2009 World Championships in the 800m. 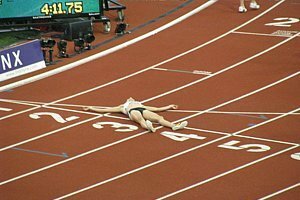 Does Galen Rupp really have a shot at winning a medal in Berlin? Anyone ever try training like Frank Shorter? 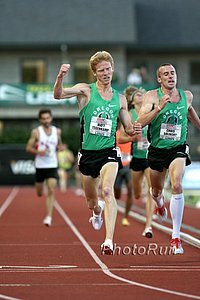 The UNCENSORED "Week that Was"
Abdi Looks To Retain 2008 Title Against Fam, Sell, Carney, Moran And Other Top Americans Moran, Carney and Abdi finished within 2 seconds of each other in the Eugene 10k less than a week ago while Fam won the US 15k title earlier this year and Sell ran his best half marathon in Houston this year as well. Anthony Famiglietti And Abdi To Face Tough African Field At Atlanta's Peachtree 10k The Americans don't have a prayer to win this one as Sammy Kitwara and Tadese Tola will be in Hotlanta. *Jamaican Isa Phillips Will Be Major Obstacle To USA 1-2-3 400h Sweep He's now the third-fastest Jamaican ever at the event after a 48.08 this weekend. 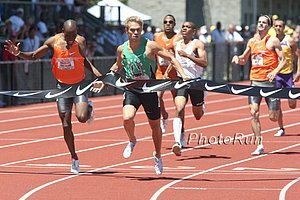 Sunday Men's Distance Action LRC Lomong Gets First, Symmonds Gets Another, Webb A No Show In the men's 800, rivals Nick Symmonds and Khadevis Robinson put on a show down the homestretch with Symmonds coming out on top. In the men's 1,500, Alan Webb pulled out before the race with an injury, and that left favorites Lopez Lomong and Leo Manzano dueling down the homestretch with Lomong coming out on top. Arkansas Razorback Dorian Ulrey closed nearly as fast but started the last lap a second back and finished 3rd. 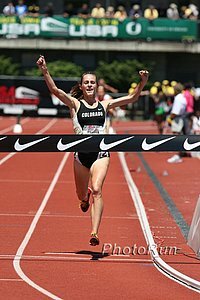 Recap and race videos. 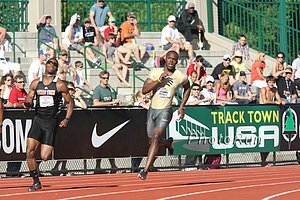 *Galen Rupp Selects Michael Johnson To Be His Agent Somehow we don't see Rupp pulling a Wariner and signing with adidas and then dumping his coach. *Ben Bruce On Men's Steeple: "I Blew It." LetsRun.com Oslo Preview Stars include Kaki, Bekele, Isinbayeva, Ohuruogu vs. Richards, Defar vs. Melkamu vs. Cheruiyot, The Dream Mile and even Alistair Cragg vs. Ryan Gregson. Sanya Richards, Only 24, Couldn't Be Happier Heading Into Clash In the article, she discusses her wedding planning with a TV celeb planner and how happy she is. Oslo Dream Mile Preview Brit Andy Baddeley is the returning champion of the legendary event but will have his hands full* with Augustine Choge - he of 3:29 form. *Not anymore, as Baddeley is injured and won't compete. Bislett Games See Return Of 5,000m After 2 Years Without A Race Longer Than 1 Mile Meseret Defar and Tirunesh Dibaba will clash over 5,000m. Men's And Women's 5,000m Previews Kenenisa Bekele, going for the Golden League Jackpot this year, will face 10 men who have run under 13:00. Christine Ohuruogu Makes Rare Appearance Against Sanya Richards Richards has broken 50 seconds 34 times in her career vs. Ohuruogu's 2! 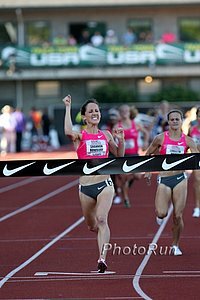 Dawn Harper Named USATF Athlete Of The Week Harper, Olympic champ at 100m hurdles, again comes out on top versus Lolo Jones as she wins the US title and the Visa Championship Series 25k. Kenya Selects 3rd Placer At Trials (Bernard Kipyego) Over Moses Masai For The World Champs Team At 10k, Will Only Have 1 Woman On Team If anyone needed proof that Kenya is still a male-dominated society, it is that the US will send 3 to Worlds in the women's 10k and as it stands Kenya will send 1. 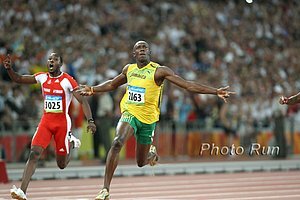 Michael Johnson's 3 Steps To Save The Sport Shorter meets, more sponsorship on athletes jerseys, and relevant events focusing on competition not records. And how about attempting to entertain fans at the event? That means music. If they do it at every other sporting event in the world why not track? Sunday Women's Distance Action LRC Hazel Clark Gets National Title #5 As Maggie Vessey Leaves It Too Late, Barringer Cruises, Willard Makes 2nd World Champs Team In the women's 800, Hazel Clark went wire-to-wire as Prefontaine surprise winner Maggie Vessey took her Borzakovskiy-like come-from-behind tactics to another level. With 200 meters to go, she was 20 meters behind. She threw down a 28-second last 200 but it was too little too late as she finished 4th. 20-year-old Phoebe Wright picked the perfect time for a nearly 1-second PR to finish 3rd in this tight race. 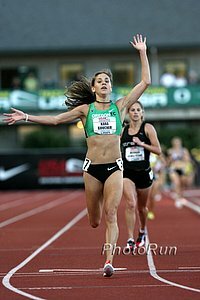 Jenny Barringer took the drama out of the women's steeple as she dominated and Anna Willard was content to just make the World Championships team after she made it in the 1,500 the day before. Collegian Bridget Franek finished third to put a ticket to Berlin on the agenda. *Mo Farah To Return From Pyrenees With Hopes Of Breaking Moorcroft's 13:00 5k Record Farah has been super-dedicated this year to his training, traveling to Kenya over the winter and now to the Pyrenées to Paula Radcliffe's camp, and his performances have soared. *Arkansas Razorback Wins Jamaican Long Jump Trials With A-Standard 8.21 Big performance for Alain Bailey. *Rocking 'N' Rolling In Seattle Marathon And Half Marathon Peter Gilmore nabs second in 2:18 while Berhane Adere ran a 1:11 half. *Kenyan Marathon Teams Announced For World Champs Martin Lel relegated to backup on the men's side. Catherine Ndereba, too. *Nike Inks 4-Year Deal With USATF That Will Expand If Chicago Wins 2016 Olympic Bid The deal with the global running apparel and footwear leader is a rather humble $2.5 million a year. *Opinionated Cram And Van Commenee Clash Over Former's Criticisms We're not surprised by this. Carol Goodrow's Kids Running Log Your kids run a half-mile fill out the paper log mail it in and get a free bookmark via Carol and USATF. Plus, there are a couple of good books for kid runners which we reviewed here and here.